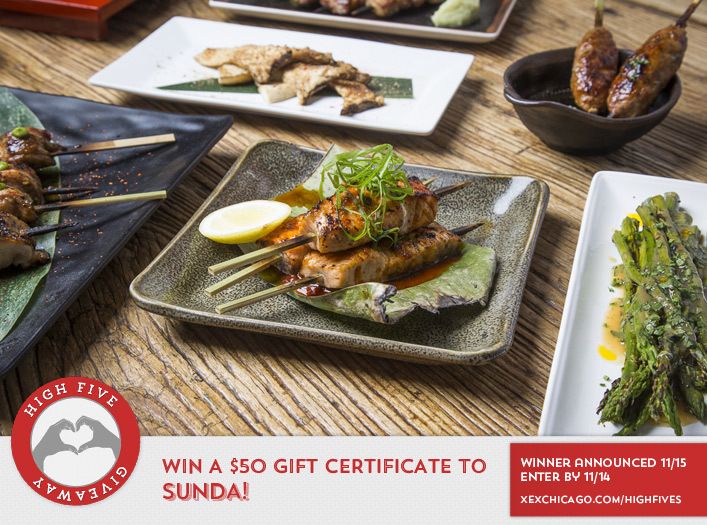 Win a $50 Gift Certificate to Sunda! Congratulations to Danielle McDonald on winning our 181st High Five Giveaway! Thanks to all who entered. Simple, flavorful dishes are served and shared while a full sushi bar provides an assortment of sushi, sashimi and nigiri options. The beverage program revolves around a progressive list of premium sakes, Asian beers, champagnes, wine and a seasonal craft cocktail list. Sunda is located at 110 W Illinois Street, Chicago. Learn more about Sunda at SundaChicago.com or call them at 312-644-0500. What XEX stylist styled the hair of the model in our Facebook cover photo? Now, just add a comment to this post with the right answer to be eligible to win! The winner will be announced on Wednesday, November 15. Enter by midnight on Tuesday, November 14! Nelson did her hair. It looks amazing!! Hair by Nelson Segarra, XEX Lead Stylist! Hair was styled by Nelson Seggara , XEX Lead Stylist! Looks Great! Keara Duchene was responsible for this great look.